BAILA con Duende was reviewed favorably in the media on FOX NEWS GOOD DAY LA in the segment series called Out and About. Lifestyle reporter Mar Yvette interviewed artists Mark Bradford, Artis Lane, Lili Bernard, Derrick Maddox, and Isaiah Bernard Ferguson. Rosie Lee Hooks, Director of the Watts Towers Arts Center, spoke about the upcoming Drum and Jazz Festival. Dancers Roxanne & Juan Carlos Blanco were featured in a preview of the festival. BAILA con Duende was the featured story in four scenes, totaling ten minutes, which aired every hour on GOOD DAY LA, from 6:00 a.m. to 9:45 a.m. on September 26, 2012. In the press, BAILA con Duende was reviewed favorably by ARTVOICES MAGAZINE (published in Los Angeles), TIKKUN MAGAZINE (published nationally) and OBJEXTS MAGAZINE (published in Berlin). WATTS TOWERS ARTS CENTER AND CHARLES MINGUS YOUTH ARTS CENTER CAMPUS Los Angeles, CA. BAILA con Duende, curated by artist Lili Bernard at the Watts Towers Arts Center, spills over from the main Noah Purifoy galleries into the Charles Mingus Youth Art Center. It has a few slippery premises. First, it should be noted that “BAILA,” which you might assume derives from the Spanish verb for “to dance,” is actually Bernard’s acronym for “Black Artists in Los Angeles.” The rest of the title, “con Duende,” is Spanish for “with spirit,” though “duende” can apparently be tricky to translate. It has its roots in a word for “fairy” or “magic” or “magic elf,” and it can refer to authenticity or having soul. “Spirit” makes the most sense for Bernard’s show, however: Black Artists in Los Angeles with Spirit. The show’s subtitle, “The First Black Artists in Los Angeles Group Exhibition,” is tricky too. The particularly short press release, which says “the purpose of the exhibition is to reveal the breadth and diversity of the ‘Black Art’ Diaspora,” suggests it’s the first exhibition in which BAILA is being treated as a group. But of course, “Black Art” is in quotation marks for a reason. Of the seventy-three artists in the show, some have been known for decades or have only recently become known for work made decades ago. Others have some mainstream art-world clout, and have shown in museums. Others remain peripheral. Given this range, could “Black Art in L.A.” actually be a coherent thing? Derrick Maddox, It Is What It Ain’t (The American Dream), 2012, Acrylic on White Bread and Mixed Media. PHOTO BY LILI BERNARD. Seeing all of BAILA con Duende takes a while—it does indeed have “breadth and diversity.” If you start in the Watts Arts Center and go counterclockwise from the door, the first two works you will see are John Outterbridge’s Broken Tongues and Sacred Hymns and Joseph Lewis’ To Be Sold and Lent. Together they set the tone pretty well, mostly by not setting a consistent tone at all. Outterbridge’s roughed-up, wooden wall-hanging sculpture feels deep and battered, like a relic rescued from some rural place. Lewis’ precisely designed print parodies slave auction announcements. A white woman and her children will be available for purchase just in time for Christmas, it says in an old-fashioned font. BAILA con Duende stays discordant like this all the way through. On one back wall in the main building, a string of cutout photographs by installation artist Castillo shows the artist wearing only a sackcloth bag. This string of photos hangs beside a huge, regal painting by Toni Scott of three male figures amidst red and orange flames. Enough would be happening in the exhibition itself without extra activity in the galleries. But the day I visited, the Watts Arts Center campus was hosting its annual Day of the Drum Festival, and writer Mary Bucci Bush spoke in the main gallery about her novel, Sweet Hope, a story of unlikely friendship between an Italian and a black family in the early twentieth century. When I walked in, she was answering questions from her small audience about prejudice against Italian-Americans for being darker-skinned. At the same time, visitors milled around the gallery, and a wry, overtaxed gallery monitor tried to keep children from touching things, especially Derrick Maddox’s white bread slices, installed on a knee-high table. 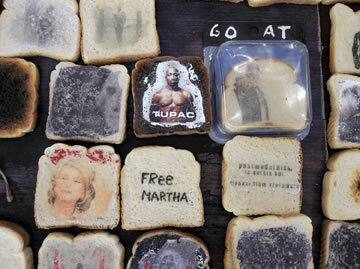 Messages and images of Tupac Shakur, George Bush, and other cultural figures had been etched into the bread, and one mother explained to her small son that “it looks like bread but actually it’s art” — maybe she didn’t realize it was bread or maybe she just didn’t think her son could comprehend how something could be both bread and art. “I don’t know why they don’t just put a rope around it,” the gallery monitor said of Maddox’s work at one point, talking to another Arts Center volunteer. For a while, a young girl and her mother, or maybe her youngish grandmother, sat in front of Lili Bernard’s painting Caroline, 2012. In it, a black woman, presumably an early nineteenth century slave, sits in a shed, posed like Olympia from Manet’s notorious 1863 painting. Only, unlike sultry Olympia, she’s muzzled with a metal bridle, handcuffed, and crying, and a blond white man is unbuttoning his fly near her feet. A blond woman wearing a white bonnet and a black-and-white collared dress stares in through the shed window. She is muzzled and crying, too, and covering the eyes of the little girl who stands beside her. I tried to imagine a mother and daughter sitting in front of a picture like this if it were isolated in a white, austere gallery without the art by over seventy other artists crowding in on it. I couldn’t. Somehow, the intense diversity of BAILA con Duende, the spate of different expressions of beauty and treachery of present and past, liberates individual artworks from any sensationalistic baggage they might have been saddled with otherwise. This seems essential to understanding why BAILA con Duende works. Usually, big, over-ambitious shows have an exhausting, stifling effect. They pull together an overly wide, unwieldy community of artists in hopes of illustrating the zeitgeist or mapping out a certain movement. But if you’re paying attention, you know right from the outset that searching for a comprehensive explanation of what “Black Artists in Los Angeles” have to say is a fool’s errand. This show refuses to give one. The only fruitful way to engage with BAILA con Duende is to take the pictures and objects that interest you at face value, and try to understand why they matter. Click here to read the article on the ArtVoices Magazine website. ARTISTS IN SHOW: Mark Bradford, Kehinde Wiley, Betye Saar, John Outterbridge, Artis Lane, William Pajaud, Samella Lewis, Charles Gaines, Henry Taylor, Joe Lewis, Ulysses Jenkins, Noah Davis, Rodney McMillian, Charles Dickson, Toni Scott, Dale Brockman Davis, Dominique Moody, Lili Bernard, Derrick Maddox, Isabelle Lutterodt, Kenyatta A.C. Hinkle, Vincent Johnson, Bernard Hoyes, Charles Bibbs, Joseph Sims, Duane Paul, Zeal Harris, Miles Regis, Castillo, Aaron Waugh, Rosalyn Myles, Carlos Spivey, Raksha Parekh, Steven J. Brooks, Teresa Tolliver, Lavialle Campbell, Yrneh Gabon Brown, Michael Massenburg, J Michael Walker, Anna Martine Whitehead, George Evans, Keith Mikell, La Monte Westmoreland, Donna Brown, June Edmonds, Silfredo La O, Wendell Wiggins, Moses Ball, Charla Puryear, Mark Broyard, Numa Perrier, Samuel Levi Jones, Milton Loupe, Ngene Mwaura, Donna Angers, AfraShe Asungi, Samuel Pace, Lisa Diane Wedgeworth, Angela Briggs, Enoch Mack, Ingrid Elburg, Buena Johnson, Sharon Barnes, Yohannes Tesfaye, Greg Pitts, Donald Bernard, Andre Ajibade, Miriam Moore, Kevin Thompson, Karien Zachery, Jim Starks, Jr., Liliane Lathan, Isaiah Bernard Ferguson, plus two artists in memoriam: Willie Middlebrook and Joseph Beckles.